Note that this list is not exhaustive. Academic departments, divisions, programs, and other SDSU organizations may provide resources that are not listed here. Alliance for Minority Participation: Broadens participation in science, mathematics, engineering and technology (STEM) disciplines and helps increase the number of low-income, first-generation and/or underrepresented minority students receiving baccalaureate degrees in STEM disciplines. 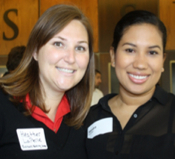 Aztec Mentor Program (AMP): Pairs students in one-on-one mentorships with established alumni/professionals in San Diego and beyond. The program is open to all juniors, seniors and grad students (2.3 GPA minimum), in any major, from any of SDSU's 8 colleges. Students gain valuable guidance on a variety of career-related topics including networking, interviewing, and job shadowing. College of Sciences: Maximizing Science Potential (MSP): Assists qualified minority students in the rigorous disciplines of science, such as physics, math, chemistry, computer science, astronomy, and geology. 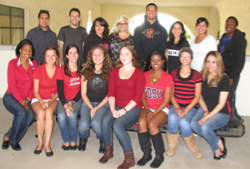 The Educational Opportunity Program (EOP): An undergraduate retention program that provides support for low-income, educationally disadvantaged students throughout their entire San Diego State University experience. Qualifying California residents receive support in their transition from high school to college, academic advising and personal counseling, free tutoring, student-to-student mentoring, and an EOP grant (depending upon financial eligibility). See also SOAR Program. Faculty-Student Mentoring Program: Supports student engagement and development through undergraduate research, scholarship and creative activities. Central to these efforts is the development of long-term relationships between students and their faculty mentors as they engage in academically purposeful tasks. High School Conferences coordinated by SDSU Student Organizations (contact Student Life & Leadership directly for the specific sponsoring student organization). Minority Access to Research Careers (MARC): Helps develop the talent and increase the number of Ph.D. degrees awarded among certain ethnic groups that have long been underrepresented in the biomedical sciences. Minority Biomedical Research Support: Prepares students for direct entry into STEM (science, technology, engineering, and mathematics) or behavioral science Ph.D. programs. SOAR Program, EOP: Available to first-semester students, the SOAR (Success, Opportunity, Academics, Relationship) Program pairs trained upper-class student mentors with incoming freshmen called protégés. Mentors serve as guides to assist new students through the maze of rules, regulations, expectations, and activities of general college life. Student-Athlete Mentoring Program: Student-Athlete Academic Support Services employs mentors who work with first-year, new transfer, and some upperclass student-athletes. Mentors help student-athletes balance athletic and academic endeavors in weekly individual meetings. The Aztec Mentor Program (AMP) pairs students in one-on-one mentorships with established alumni/ professionals in San Diego and beyond. Students gain valuable guidance on a variety of career-related topics including networking, interviewing, and job shadowing. The MARC Program supports students in ethnic groups that have traditionally been underrepresented in the biomedical sciences. Target ethnic groups are African-Americans, Hispanics, Latinos, Native Americans and Pacific Islanders. SOAR (Success, Opportunity, Academics, Relationship) helps EOP students succeed. The SOAR Mentor Program pairs trained upper-class student mentors with incoming freshmen called protégés. Who should apply to be a protégé? First semester students who would appreciate the guidance, support and friendship of an experienced SDSU student.